Civil Rights Legend: Martin Luther King, Jr.
Martin Luther King, Jr. was a baptist minister and a leader of the civil rights movement in America during the 1950s and 1960s. Through "civil disobedience," a form of protest King adopted from Gandhi, Martin Luther King helped bring an end to racial segregation in the United States. To honor the life of Dr. King, Martin Luther King, Jr. Day is celebrated in the U.S. on the third Monday of January each year. To understand the life of Dr. King, following are some places that have been especially touched by his legacy. Note that this article merely touches on a few aspects of Dr. King's life. About's guide to American History has a more comprehensive profile on Martin Luther King, Jr.
American Civil Rights leader Martin Luther King, Jr., was born on January 15, 1929, in Atlanta, Georgia. Dr. King learned about the tenets and stories of Christianity from his father, Reverend Martin Luther King, Sr.; family; and fellow parishioners at the Ebenezer Baptist Church. King would later preach at Ebenezer Baptist Church for a time as a co-pastor with his father. King gave some of his most famous speeches at the church. Visitors to Atlanta can tour Martin Luther King's childhood home (limited access), the Ebenezer Baptist Church, and the final resting place of Dr. King and his wife, Coretta Scott King, all of which are part of the Martin Luther King Jr. National Historic Site maintained by the National Park Service. For an in-depth introduction into the civil rights work promoted by Dr. King, visit The Martin Luther King Jr. Center for Nonviolent Social Change. The city of Atlanta even honors Dr. King at its airport. You can find a small, permanent installation about the life of MLK, Jr. in concourse E of Atlanta's Hartsfield-Jackson Airport. Note that this article merely touches on a few aspects of Dr. King's life. About's guide to American History has a more comprehensive profile on Martin Luther King, Jr.. The state of Alabama is significant to the life of Martin Luther King for various reasons. Dr. King met and married his wife Coretta Scott King in Alabama. They settled in the capital, Montgomery, where he became a pastor of the Dexter Avenue Baptist Church in 1954. Dr. King's sermons from the Dexter Avenue pulpit propelled him to prominence in the burgeoning civil rights movement. From the pulpit of the Dexter Avenue church, King helped organize the Montgomery Bus Boycott in 1955, a movement spawned from the refusal of Rosa Parks to give up her seat to a white passenger on a Montgomery city bus. The 385-day boycott resulted in the end of racial segregation on Montgomery buses. Dr. King was also active in Alabama's largest city, Birmingham. In the spring of 1963, Dr. King and his colleagues in the Southern Christian Leadership Conference (SCLC), an organization he helped to found in 1957, led a nonviolent campaign in Birmingham to end Jim Crow Laws. Dr. King and the SCLC's efforts helped to end racial segregation in public places in Birmingham, leading the way for Jim Crow Laws across the south to crumble over the next decade. Perhaps Martin Luther King's best-known actions in Alabama were the three marches he led from Selma to Montgomery in 1965 to protest voting rights for black Americans. The first two marches were met with violence. The first march, held on March 7, 1965, was called "Bloody Sunday" after police attacked approximately 600 protestors with billy clubs and tear gas. The second march, on March 9, saw more than 2,500 meet resistance after crossing Selma's Edmund Pettus Bridge. In the intervening week, Federal District Court Judge Frank Minis Johnson ruled that Martin Luther King, Jr. and his fellow protestors had the right to protest under the First Amendment of the Constitution. On March 16, King and other voting rights activists began their march from Selma to Montgomery with the protection of 2,000 U.S. Army soldiers and 1,900 members of the Alabama National Guard. The march ended in Montgomery on March 24, 1965. Today, the Selma to Montgomery March is memorialized as the Selma to Montgomery National Historic Trail. 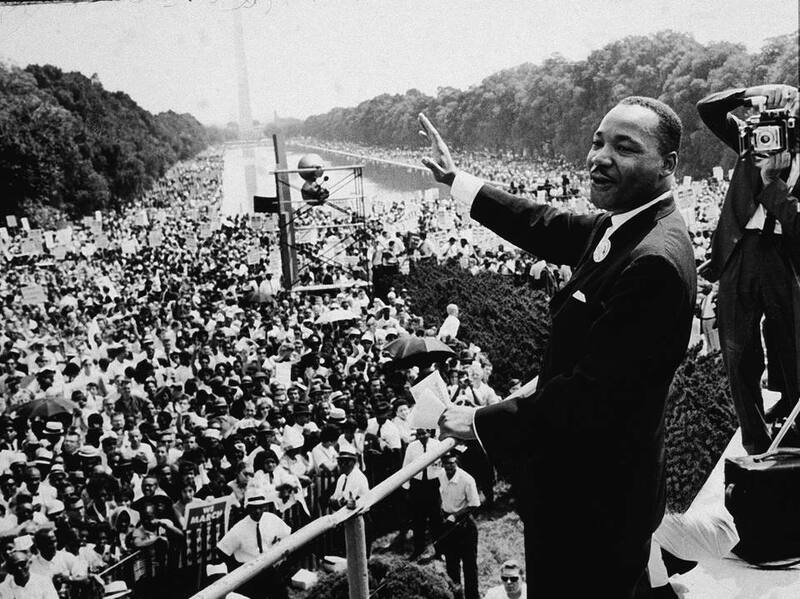 Martin Luther King, Jr.'s most famous speech - indeed, one of the most famous speeches in American history - was the "I Have a Dream" speech, which he delivered from the steps of the Lincoln Memorial in Washington, DC, on August 28, 1963, as part of the March on Washington. Hundreds of thousands of citizens, of all colors and creeds, attended the March on Washington and witnessed Dr. King deliver his speech from the Lincoln Memorial. This was a major turning point in the Civil Rights movement and vaunted King into the pantheon of American leaders. To commemorate Dr. King's legacy, Washington D.C. dedicated a memorial to him in 2011. The Martin Luther King, Jr. National Memorial is on the National Mall. It is the first memorial on the National Mall to a non-president and Dr. King is the first black American to be memorialized with a solo memorial on the Mall. In March of 1968, Martin Luther King, Jr., traveled to Memphis, Tennessee, to assist black public sanitation workers with their strike for equal wages. By this time, King was a national figure, and the Civil Rights movement he had started was 13 years old. Nevertheless, Dr. King was being harassed daily and getting death threats regularly from white Americans unhappy with the direction the Civil Rights movement was headed. We've got some difficult days ahead. But it doesn't really matter with me now. Because I've been to the mountaintop. I don't mind. Like anybody, I would like to live - a long life; longevity has its place. But I'm not concerned about that now. I just want to do God's will. And He's allowed me to go up to the mountain. And I've looked over. And I've seen the Promised Land. I may not get there with you. But I want you to know tonight, that we, as a people, will get to the Promised Land. So I'm happy, tonight. I'm not worried about anything. I'm not fearing any man. Mine eyes have seen the glory of the coming of the Lord. On April 4, 1968, as he stood outside room 306 of the Lorraine Motel, Dr. Martin Luther King, Jr., was shot. Within an hour, King was declared dead. In the wake of the assassination, the owner of the Lorraine Motel maintained room 306 as a shrine to Dr. King. Today, the Lorraine Motel houses the National Civil Rights Museum, which includes exhibits about Dr. King's life and assassination. Philadelphia has been honoring the life of Martin Luther King Jr for more than 22 years now by mobilizing more than 140,000 people for a day of volunteering and other activities, such as The Philadelphia Orchestra's Free Martin Luther King Jr. Tribute Concert and festivals at a number of museums throughout the City of Brotherly Love. The Annual Greater Philadelphia Martin Luther King Jr. Day of Service happens this year on January 16, 2017. The day-long event happens at the The National Constitution Center. For a $5 admission fee, you'll get access to activities such as a live reading of King's "I Have a Dream" speech, and can donate books and school supplies to those in need. To register for a community project, such as serving meals to the homeless or doing an outdoor cleanup project, register here.